What narrative techniques does Lawson use to shape the reader’s perception of the drover’s wife? “The Drover’s Wife” by Henry Lawson (2005) is an Australian novel set in Australia featuring the wife of a drover. It is a historical story. Most historical stories take place in the past, and so does this one. A drover, according to the Oxford English Dictionary is “one who drives sheep” and a wife is “a married woman” so as we can see, the themes of sheep and marriage run deep throughout the story. Henry Lawson uses myriads of multiple narrative techniques throughout the novel which shape the reader’s perception of the drover’s wife. For example, flashbacks, description, humour and sadness. The first technique Lawson uses to illustrate the drover’s wife is flashbacks. The story is set a long time ago with the wife looking back on her life and when a black snake viscously attacked her children. On page three of the story she thinks back to floods and bushfires and being attached by Aboriginal people. She also thinks about her husband who always treats her like a “princess.” (Lawson, p3, 2005). As we can see from this quotation, the writer shows us lots of things about the drover’s wife’s past so we will know more about her. Secondly, there is description like “He is not a very beautiful dog, and the light shows numerous old wounds where the hair will not grow.” (p5) Here they are talking about their dog Alligator, who has bravely fought the snake and got bit and so his hair is falling out. The description “Her husband is an Australian and so is she” is also vital, as it lets the reader know that the story is set in Australia, and not America, for example. Finally, an “evil pair of small, bright bead-like eyes” demonstrates that the snake is evil. 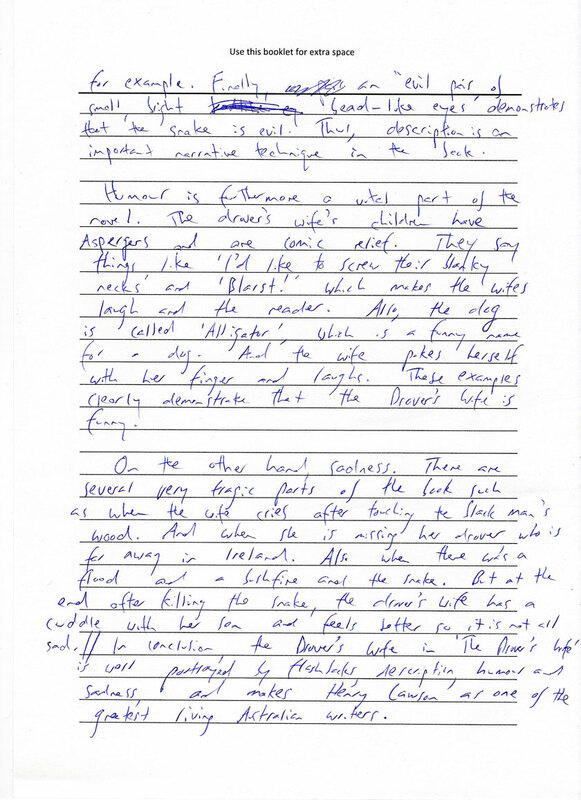 Thus, description is an important narrative technique in the book. Humour is furthermore a vital part of the novel. The drover’s wife’s children have Aspergers and are comic relief. They say things like “I’d like to screw their blanky necks” and ‘Blarst!’ which makes the wife laugh and the reader. Also, the dog is called Alligator, which is a funny name for a dog. And the wife pokes herself with her finger and laughs. These examples clearly demonstrate that the drover’s wife is funny. On the other hand, sadness. There are several very tragic parts of the book such as when the wife cries after touching the black man’s wood. And when she is missing her drover, who is far away in Ireland. And also when there was a flood and a bushfire and the snake. But at the end after killing the snake, the drover’s wife has a cuddle with her son and feels better, so it is not all sad. In conclusion, the drover’s wife in “The Drover’s Wife” is well portrayed by flashbacks, description, humour and sadness, and marks Henry Lawson as one of the greatest living Australian writers.